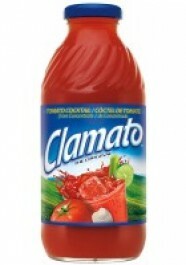 America's favorite tomato juice is still Clamato Original Tomato Cocktail. A bit spicy, but very easy to drink. Also great in cocktail and -yes- beer! Shake well, serve chilled. Now in a bottle. Water, Tomato Concentrate, High Fructose, Corn Syrup, Monosodium Glutamate, Salt, Citric Acid, Onion Powder, Celery Seed, Ascorbic Acid (to Maintain Color), Garlic Powder, Dried Clam Broth, Spices, Vinegar, Natural Flavors, Red 40.